Despite their attempt to appeal to “producers and remixers,” though, it seems they could have broadened their audience by including loop recording as well as playback. 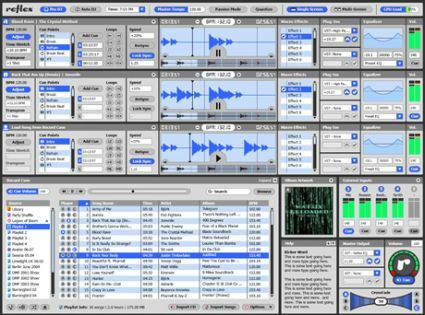 That’s still something many apps don’t do as well as they could (Ableton Live included, though in fairness that’s partly because of the nature of its Session view design which has other advantages). That said, I’m sure Reflex will be a contender, going up against Deckadance, Serato Scratch, Torq, and NI’s upcoming Traktor Scratch. Let the best DJ app win. We’ll get our DJ experts on this so I don’t just get carried away imagining bizarre setups involving Reaktor samplers running as plug-ins and glitchy music no one could dance to. US$329 with time-coded vinyl and CDs; $279 without.